Nine days in and we’re very much treating this as a marathon rather than a sprint. Easing our bodies in feels like a smart way to avoid early injuries or niggles that could cause big setbacks farther down the line. We’re keeping the mileage low to start with and building up over time. Life on the trail has so far treated us well. Our feet and knees are feeling good for the most part and morale is pretty high (except for the moment that I (Siân) woke up to find that a mouse had eaten my last cream egg, the wee sh!te. Although that teaches me for forgetting to put it in the bear bag!). Today marks our first off-trail experience. After eight days of hiking we’ve arrived at the wonderful Top Of Georgia hostel for our first shower of the trip. I don’t want to tell you how many days Dave took before changing his underwear! We arrived dirty and weather-beaten, and now we’re just weather-beaten. The weather really has been just like back home – all four seasons in a week. We’ve had glorious sunshine, snow, hail, thick fog, torrential rain, gale-force winds, and subzero temperatures, so Georgia really has been putting our kit to the test. 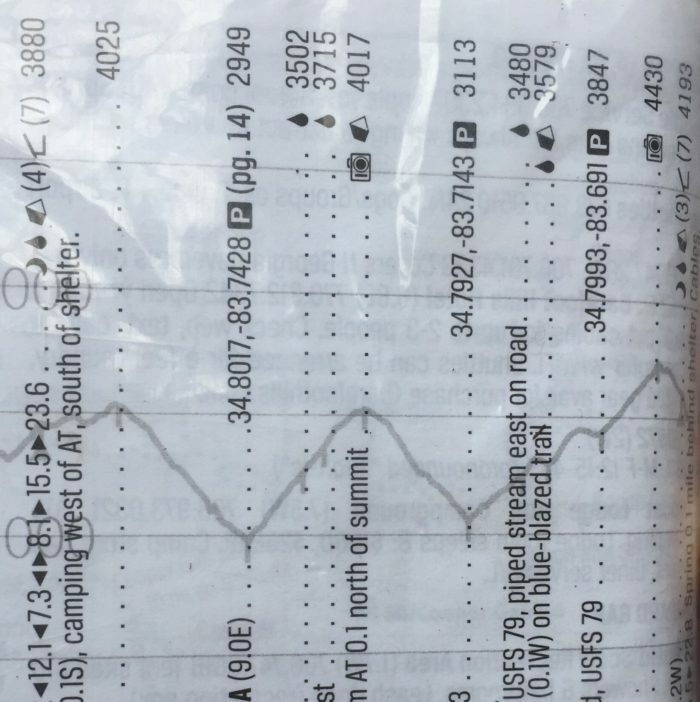 Although that sounds like a lot, the hikes each day have been genuinely enjoyable despite the ridiculous number of named peaks we seem to climb each day. Something else that really pulled us through on the coldest day, as we were halfway through our journey over “The Rollercoaster” (see image below and you’ll know why it’s called that), was our first experience of trail magic. 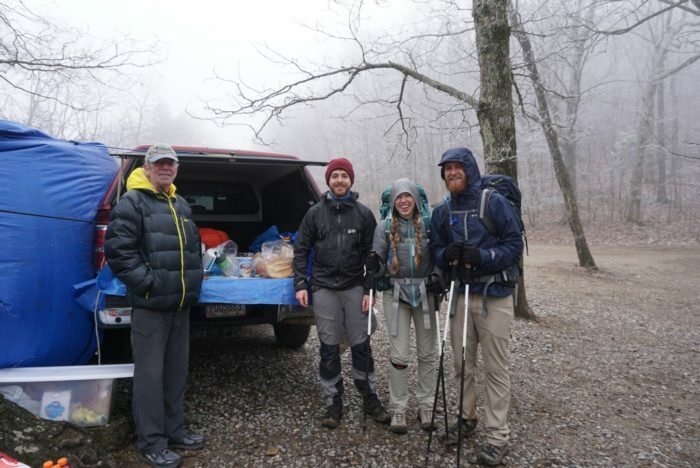 The incredible Leonard “Lion Heart” was standing at the base of the mountain handing out hot chocolate, fruit, and other tasty treats to the thru-hikers about to make the climb. These people really are trail angels. They manage to find the most perfect moment to give you a boost when the road ahead is tough. We cannot thank him enough. “The Rollercoaster” – you can see the elevations at the top of the image. Leonard “Lion Heart” providing some trail magic. We are, however, finally settling in to trail life. It no longer seems unusual to have to filter our water from the stream to cook (Dave actively enjoys the task) or to have to put up our home at the end of every day, and there’s a real comfort in that. I must admit that we both rather stay in the tent as a few too many shelter stays with the most ridiculous snorers has put us off them somewhat, but it’s sometimes a nice alternative when our friends are there too. All in all, though, AT life is pretty awesome (and blister-free so far). Tomorrow we’ll cross our first state line and enter North Carolina, which will feel like a significant milestone. Unfortunately we’re not expecting the cold weather to let up much and a few more mornings of frozen water and boot laces lie ahead. We just keep reminding ourselves that the summer months will come eventually. Hey Sian and Dave. Try putting your water bottle in your sleeping bag with you at night to prevent it from freezing. If it feels uncomfortable wrap it in a spare sock to pad it a little.